At 11pm, I felt relief. A few minutes later, I felt admiration for McCain showing his true colors by conceding with dignity. Then Barack stepped up and said what we all knew was true: tonight we have only opened the door — now the hard work truly begins. We shall see what kind of President Barack Obama really becomes, but I am glad this country chose hope and change. Americans believe that our country is a beacon, and it is time we earned that belief once more. This country has a lot to do and fix, but tonight, I am happy. But wait, food what when how? Tonight we made two dishes: a roasted chicken stuffed with olives and potatoes from Stacey at Stacey Snacks, and a fennel gratin from an Alice Waters recipe. Both were absolutely delicious. Cut the fennel bulbs in half and then into wedges. Mince up a small amount of the fennel fronds and set aside. Boil the wedges in salted water for 5 minutes. Remove the fennel with a slotted spoon and set aside. Reserve 1/3 cup of the cooking liquid. Next, make a white sauce by melting the butter on medium heat, adding the flour, and cooking for a couple minutes, whisking constantly. Then slowly add the milk and fennel cooking liquid in small amounts, whisking as you go. Once the liquid is mixed in, lower the heat to a very soft simmer and cook for another 15 minutes. Turn off the heat and stir in a couple of pinches of salt, and the nutmeg, paprika, pepper flakes, and parmesan (note: Waters uses cayenne pepper instead of the hot paprika and pepper flakes). Butter a baking dish and spread out the fennel wedges, and spoon the sauce on top. Bake in an oven set at 375F or 400F for 30 minutes or so (note: Waters calls for 375F, but we had the oven set to 400F since we were also finishing the chicken roast). When the tops are browned, remove, sprinkle with a little salt, pepper and the fennel fronds, and serve. Comment: I found that the amounts for the white sauce led to a thick sauce that did not cover all of the fennel, but that actually ended up being a good thing, keeping the dish from being too rich and allowing you as the eater to choose what kind of mouthful you wanted. 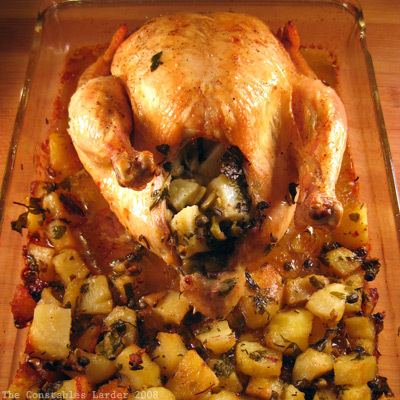 The other part of the meal was a roast chicken with potatoes, olives, capers, rosemary and other good stuff. We spotted this recipe on Stacey Snacks (link), and Lisl prepped and cooked the dish. It was marvelous. Follow that link to the recipe, and listen when Stacey says to make sure that the potatoes are cooked before you put it all in the oven, because the potatoes stuffed inside the chicken will not cook all that much, even in the oven for 1 hr 15 minutes at 400F.